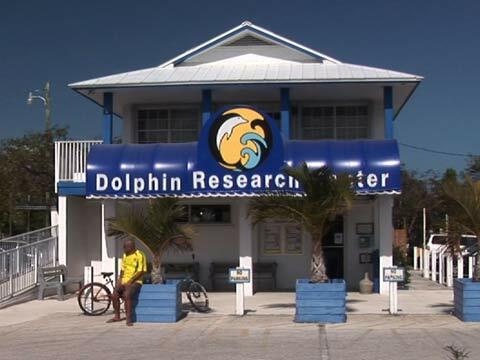 "Dolphin Research Center is a not-for-profit organization with goals to promote peaceful coexistence, cooperation and communication between marine mammals, humans and the environment we share through research and education and to operate for the advancement of research and education. The health and well being of DRCâ€™s dolphins holds absolute precedence over all other interests. DRC will undertake no program or activity that compromises this basic commitment.â€ DRCâ€™s dolphin research teaches the world more about the amazing abilities of this species. Every program, whether itâ€™s an interactive dolphin encounter, a dolphin education experience such as DolphinLab or Dolphin Camp, or our special needs activities for people with disabilities, expands peoplesâ€™ knowledge and appreciation of marine mammals. Dolphin Research Center is funded by people who visit the facility to see the dolphins and sea lions, swim with dolphins, or take part in another program, as well as by those who join the DRC family when they adopt a dolphin or enroll in one of our other membership plans. Dolphin Research Center General Information Spend an hour or the whole day learning all about our family of Atlantic bottlenose dolphins and California sea lions. Experience the different "dolphinalities" during regularly scheduled narrated sessions. Each session demonstrates a different aspect of these amazing animals' lives. From high-flying athletics and Dolphin Fun Facts to medical behavior training and research-in-progress, no two sessions are alike. Join their fun and cheer their progress. They love an audience! Hours of Operation: Open seven days a week, 9 a.m. to 4:30 p.m. (Sorry, we're closed to the public on New Year's Day, Memorial Day, 4th of July, Labor Day, Thanksgiving Day & Christmas Day.) General admission: Adults-$19.50; Seniors 55 and over-$16.50; Children 4-12-$13.50; Children 3 and under-Free. Click here for discount admission coupon. Interactive Programs: Click here to learn about Trainer for a Day, Researcher for a Day, Shallow Water and Deep Water Dolphin Encounter, Dolphin Dip and our other terrific hands-on programs. Parking: Free parking. Bus parking also available on a limited basis. Refreshments: Hammer's CafÃ© sells cold drinks, ice cream, and a variety of lunch items and snacks. Accessibility: Wheelchair accessible restrooms. Pathways provide easy maneuverability around the facility. DRC is committed to removing barriers for people with disabilities who wish to interact with our dolphins. If you have a special need or concern, click here for more information. Group Admissions: DRC offers discounted admission to tour groups of 20 or more, with advance notice. Call 305-289-1121, ext. 239 to arrange your group's visit. Classes & Youth Groups: Our Education Department offers special half-day field trips for students and youth groups. Click here to find out more. DRC is a not-for-profit facility. Your visit supports our mission to provide the best possible home for our family, and to aid and rescue endangered manatees in the Florida Keys. Thank you!